One of the best treatments for perking up a mature lawn is de-thatching, especially if the sod is dense. This can be done with a hand rake or a machine rented from a garden center or hardware store. Removing the thatch means lifting out dead under-layers of grass and debris that prevent air, water and nutrients from reaching the soil. In a less dense sod, pick up winter debris with a mower set on mid- to low-level to the ground. Collect debris in a bag and discard or add to the compost pile. Most types of grass, except zoysia, will benefit from a fertilizer application in March, even though little grass may be showing. Lots of grass plants are dormant now, but will jump to life quickly in the coming weeks. Fertilizer can be applied alone or as part of a "weed-and-feed" preparation, which will significantly prevent dandelions and numerous other broadleaf weeds by killing those seeds. Zoysia grass is dormant in March, and shouldn't be fertilized until it starts greening up, usually in May. But check your zone conditions via the map at right. In warmer zones, zoysia can be treated now. If you already have growing weeds, apply a pre-emergent herbicide that works against crabgrass, dandelions and most of the broadleaf weeds. It can be in granules or spray form. 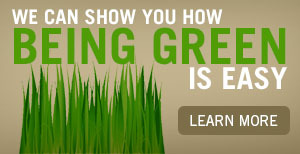 Although it's tempting, experts do not recommend broadcasting expensive grass seed over a mature lawn in the spring. Or starting a new one by seed, either. The reasons: it'll get too warm too quickly for the young grass sprouts to grow well through the hot, dry summer, and birds will likely scavenge a lot of the seed. Or, heavy spring rains will just wash the seed away. That's why autumn is the best time for establishing a new lawn. So, what to do about bare spots or areas smaller than the whole yard? Apply grass-patching materials, which work very well. If you must have new grass in a large area, put down rolls of sod, but keep them well watered for at least the first month. If you are applying a lawn patch material, it's best to prepare any bare soil first by roughing it up with a rake and breaking up chunks to form a smooth texture. Apply the patch evenly and water well. Keep the area watered throughout the germination and new growth period. This may mean up to twice a day if conditions are dry. Also, take care not to spread herbicides onto the seeded areas. If you must start new grass seed now, it's best done in established sod by first aerating or verti-cutting the existing sod. Aeration, or plugging, is done by a machine that pulls out cork-sized pieces of soil and sod. Verti-cutting is done by a machine that slices small furrows into the sod and soil. 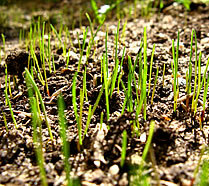 In either case, new grass seed can make direct contact with soil and has a better chance of sprouting. You can rent machines that will do these things, or have a yard service do the work for you. When fescue and bluegrass starts greening up, cut it short for the first season's mowing. Then, through mid-May, cut fescue and bluegrass at the middle blade height. Mulch the grass clippings instead of collecting them throughout the spring, unless growth is too high and the heavy mulched clippings would smother growing grass. Do not mow zoysia until April, when you will "scalpâ€ it on a low setting for the first seasonâ€™s cutting. In most cold winter places, zoysia is dormant now.